Monthly Mantra: Finding Health and Wellness in the Law | Blog | Ms. JD | Determined to Rise. I will treat myself with patience and kindness and will actively seek opportunities to show grace to others. February’s chocolates and valentines provide constant reminders of love. In this month dedicated to loving those we hold dear, we also need to internalize that feeling and treat ourselves with kindness. Belonging to a career field that prizes results under challenging circumstances, can cause us to be unforgiving of our own shortcomings as well as those of others. When faced with unrealistic expectations, it is important to remember we are human and imperfect and that it is actually a good thing. In that same vein, it is equally as vital that we remember others are human as well and are often doing their best. We are all confronted with difficulties both professionally and personally, making it critical that we treat ourselves and others with compassion. Several years ago, I worked with a demanding supervisor who’s extremely high expectations coupled with her shockingly low threshold for mistakes, made for a difficult office environment. She once assigned me a case that had a number specific deadlines. Aware of the office culture, I made each deadline a priority and submitted documents in advance of the scheduled dates to ensure they were met. Despite my efforts, my supervisor misread an e-mail and accused me of missing one of the submissions. What made this situation particularly frustrating was that a careful review of the e-mail would have revealed the mistake. I immediately internalized the situation and became angered. But then my thinking shifted. Although I knew the accusation was the result of an error, I began to think “so what if I had made a mistake, would it be irreparable? Would anyone have been harmed? Would the world have stopped spinning on it axis?” The answers were clearly no. It was at that moment that I was able to put the entire situation in perspective. If I had erred and it could be remedied, the fact that my supervisor had in fact made a mistake could be moved past as well. Several days later, my supervisor realized she misread the e-mail and apologized. Rather than expressing anger or responding smugly, I used it as an opportunity to show grace and compassion where it had not initially been extended. I warmly accepted her apology and moved forward. Being kind to myself opened the door to showing kindness to another. There will always be mistakes, shortcomings and misinterpretations. We cannot control them. But what we can control is our reaction. Responding with compassion, rather than blame, lends perspective and is far more productive long-term. Show kindness and patience with yourself the next time you make a mistake or things do not go as planned. It is far more productive to move forward than it is to obsess over a mistake that has already occurred and passed. Show grace to a colleague, professor, intern or supervisor in a situation where you would be warranted in being upset. Be the one to change the energy for the better, exchanging blame for compassion and ultimately productivity. Listen to your body. Be patient with yourself when trying to achieve a physical goal, whether that be reaching a desired weight, mastering a technique or trying a new activity. Acknowledge when your body needs rest without trying to advance your own agenda. 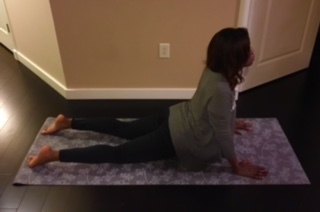 Cobra (Bhujangasana): This heart opening pose will help you to extend love and compassion to yourself and others. Lie on your stomach with your legs hip width apart and the tops of your feet flat on the floor. Place your palms flat on the floor beside your ribcage and push your torso up with your hands, lifting and opening your chest while pressing your pelvis and legs into the floor. Hold for three deep breaths.